Of course most eatable plants were first discovered growing wild, and asparagus is no exception. A wild asparagus has thin shoots thinner than a pencil and is much different than the asparagus that we find in the market. Through selective breeding and growing techniques, a modern non wild asparagus has a thicker stem with more edible flesh. 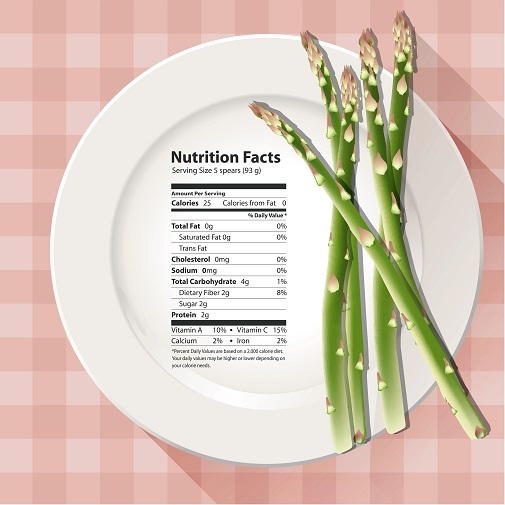 Asparagus is even a low carbohydrate food, and a 15 on the glycemic index, which is the rating of plant food and how it effects your blood glucose or insulin in the body (0-35 is low). Now for our featured recipe, and here is what you will need. Cook pasta according to package directions. Reserve 1/2 cup of pasta water before draining. Return the pasta to the pan that you cooked it in, and set aside. Heat a large skillet over medium heat. Cook the bacon until browned, but not crispy. Remove and place on paper towel lined plate to drain. Remove all but 2 tablespoons of grease from the skillet, and return to the stove. Add the chopped asparagus to the pan, stirring occasionally. Cook until tender, about 7 minutes. Add the garlic to the skillet, and cook for 1 minute more. 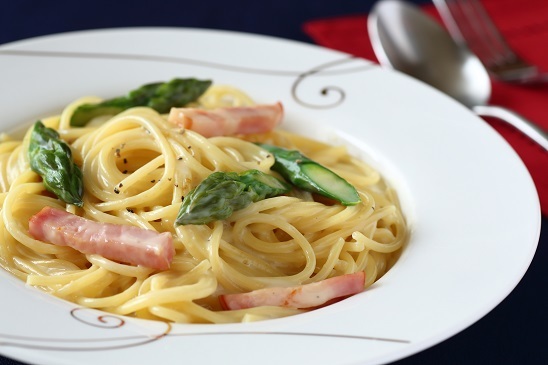 Add the cooked asparagus, garlic, bacon, and Alfredo sauce to the pot of cooked pasta. Toss to combine. If the sauce is too thick, add a bit of the saved pasta water to thin it out. Season to taste with Himalayan salt and pepper before serving (optional). Will a Low-Glycemic Diet Help Me Lose Weight? This entry was posted in Main Dish, Pasta and tagged Alfredo sauce, Asparagus, Bacon, Blood sugar, Carbohydrate, Columbia University Medical Center, Diet (nutrition), Fettuccine Alfredo, Glycemic index, Himalayan salt, Kitchen Project, low carbohydrates, medicinal benefits, medicinal purposes, Menopause, National Institutes of Health, Pasta, pasta dish ideas, wild asparagus, Women's Health Initiative. Bookmark the permalink. I love asparagus, and this recipe for it looks delicious! I will definitely try it out. Oh yummy – my kind of pasta!